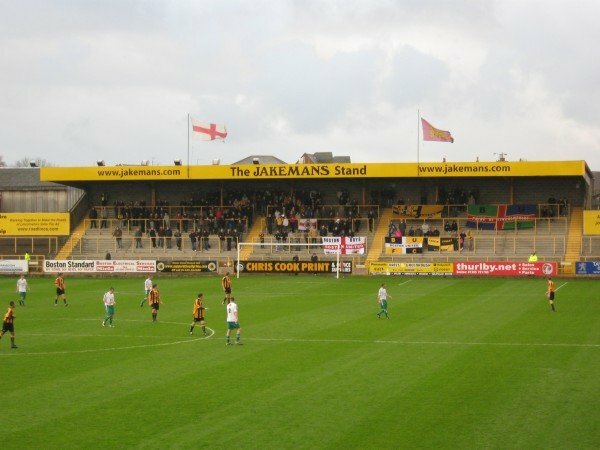 The Talking Bull self-appointed Ground Guide Guru, Simon Wright, looks ahead to the upcoming trip to the Jakemans Stadium as Hereford take on Boston United in the Vanarama National League North this weekend. It’s more than a feeling! Sorry, couldn’t resist. The Pilgrims are not making much progress as they battle through their eighth season at this level. They were relegated from the Football League way back in 2007 and subsequently relegated again for financial mismanagement. In recent years, they regularly compete in the Play-Offs and equally regularly don’t win them. For those not familiar with the town, Boston is based in East Lincolnshire, close to the Wash and vaguely close to both Kings Lynn and Lincoln. Town descriptions indicate much in common with Kings Lynn. Boston is an isolated town and port, rather dog-eared round the edges with a small, multi-cultural population of 35,000. Did I mention the town has the highest obesity rate in the UK? East Lincolnshire is a long old haul at 345 miles return from the Shire. (Isn’t it good to know there are five longer journeys than this one?) If you need a reason to go, this will be a new and very smart ground for most folk. And how novel to travel East rather than North. Such big miles suggest an overnight for those who can. I spent a lot of time looking for places of interest in Boston or the towns to the West before just giving up. There aren’t many to find. In desperation, I looked up the chain of cafes called the Boston Tea Party where I enjoy the full breakfast. Our nearest are in Worcester or Birmingham. But there isn’t one in Boston! The Jakemans Stadium capacity is nigh on 7,000, mainly seating. York Street, as it used to be called, was smart and well-appointed many years before style became fashionable. The smartness of the place was my lasting memory of my solitary visit back in the 1990’s. Having said all that, the Pilgrims have plans for a new 5,000 capacity community ground as part of the new Quadrant development on the A16, along with 500 houses. Was supposed to start in 2015, then 2017 and then complete silence on progress. So, who knows? This may be our last chance to visit. United’s isolation does help to maintain their support. The Pilgrims currently average a healthy 1,200 average, which for the size of the town is decent. We’ll be housed in part of the Lincolnshire Co-Op Stand (look for turnstiles 3 and 4). This is an unusual structure with segregated seating behind terrace. Admission prices are adults £13 Concessions: £10, Children (16 years and under): £4. There are discounts for all sorts of adult and child combos. Parking at the ground is for permit holders only. The answer for everyone else is supposedly street parking but having checked Google maps, most nearby streets have restrictions. Best of luck with that. One car park called Artillery Row is quite near and reasonable at £1.50 for 4 hours. The rest have two-hour limits. If you need refreshments, the obvious place is the club bar- the Pilgrims Lounge. Its open six days a week, from noon. No membership required. On top of the usual beer selection, a guest ale at £2.80 is promised or Spitfire at £2.90. The Jakemans Stadium is on the very edge of town and there are few handy hostelries. The nearest is a local Batemans tied house called the Coach and Horses in Main Ridge about 300 yards walk. Otherwise, you’re walking. The nearest Spoons is the Moon Under Water just over half a mile away in the High Street. It’s rated 27th best restaurant in Boston out of 148 by Tripadvisor which is faintly alarming. There is a lot more detail in the Talking Bull Good Beer Guide. Craig Elliott (38) was appointed manager of Boston United in November 2017. Already has five promotions to his name, including three promotions in four seasons for Shaw Lane. Elliott released 13 players in the summer. Others chose to go, leaving just 8 from last season. Thus, lots of newbies including three professional players from Lincoln, although two of them have since left. Recently, they signed a regular goalscorer in Gavin Allott, who was top scorer 3 years in a row at Frickley – one of the managers old clubs. He scored on his debut v Blyth. Also, a 37 year-old midfielder in David Norris. The Pilgrims are part-time, training twice a week. Defender John McCombe, the ex-Hereford United man joined them in June … and left in August. Boston use a 4-4-2 formation. Boston’s form is very hit and miss, with their best results on the road. They’ve lost 5 of the last 8 including an embarrassing defeat at home in the FA Cup by Step 4 Peterborough Sports. After which manager Elliott said “We are carrying too many individuals. There are too many players who do not want to be here. They are not putting their bodies on the line. Their body language suggests they want to be elsewhere.” Boston lost 4 home games in a row without scoring before slaughtering Blyth 4-0. They’re currently 6th in the table, despite dodgy home form, and come into the Bulls’ game after losing 1-0 at Darlington last week. Here’s an obscure fact. The Football Writer of the Year 1991 award wasn’t won by one of the usual suspects at the Times or the Telegraph. That year, it went to Richard O. Smith, then editor of the Boston United fanzine From Behind the Fences. The content was so well-written and so full of home truths about events behind the scenes that the fanzine built a national following. The United Board banned him which only led to his sales increasing. I think he packed up after 15 issues and moved away. Nowadays, he’s a BBC scriptwriter and comic author. To this day, Richard’s fanzine remains a source of great pride to older United supporters. New signings Tommy O’Sullivan and James Roberts will boost the Bulls, and if youngsters Ethan Wassall, Matt Yates and Harvey Smith can produce the same degree of commitment they showed at Stockport, a positive result is by no means beyond Marc Richards’ side. By Train: You’ll love this. Five and a half hours out with two changes to get onto the Poacher Line. Getting back is even tougher. Either miss the last half hour of play to catch the 16:48 or catch a later train which takes just the 13 hours, including a 7 hour layover in Shrewsbury, Doesn’t that sound fun? Much easier for London Bulls – just 2.5 hours each way with ample time for refuelling before the return train. By Coach: Let the pros do the long driving. Visit Hereford Awaydays Facebook page. Our away support is dropping dramatically and that gives poor Reg more headaches than usual so please support him maintain the service if you can.